Almost all plants, herbs and fruits originate from known locations near the Himalayas or other clean sources. Starting materials are tested in Indian laboratories and Jadavpur University at Kolkata, department of metallurgical engineering. Traditional Arista and Asava methodical techniques are used for manufacturing in India with checking by euroved® in Germany. The tablets are manufactured by euroved® in Italy. Batches of completed products are randomly and independently tested in Germany. On occasion euroved® double checks analytical results using separate independent laboratories. 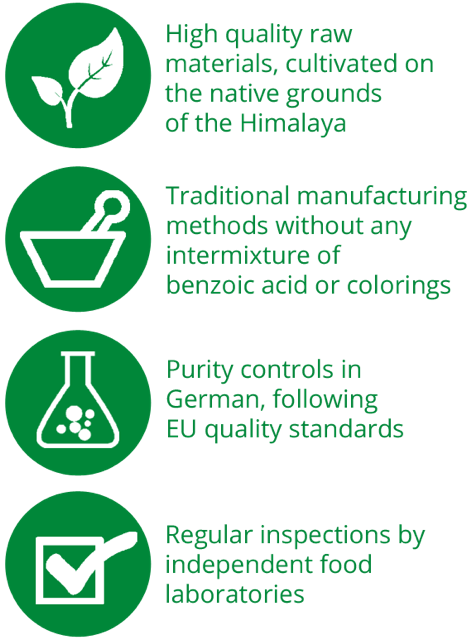 euroved® does not use Benzoic Acid or artificial colors in their products. Our products easily pass the heavy-metal standards of the European Union food laws.